The Mock Trial teams from Wheelersburg, Portsmouth West and Valley will advance to the regionals. 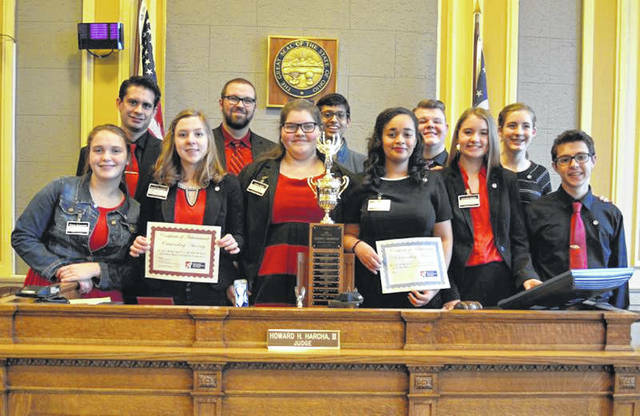 Wheelersburg emerged as champions during the Scioto County District Mock Trial Competition on Jan. 18. They will now advance to the regional competition on February 15, joined by the runner-up team from Valley (team Cody) and advancing team from Portsmouth West. Regional winners will compete in the state competition on March 7-9 in Columbus. The 2019 state champion team will represent Ohio at the National High School Mock Trial Championship in Athens, Ga. from May 16 through 18. The District Competition included 11 teams from eight schools — including Ironton, St. Joseph, Notre Dame, Portsmouth, Portsmouth West, River Valley Bidwell, South Webster, Valley, and Wheelersburg.